Baltimore, MD – Alex. 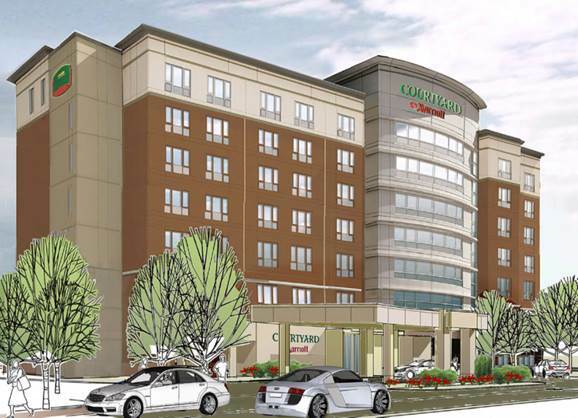 Brown Realty, Inc. (ABR) and Hotel Development Partners (HDP) have announced plans to develop a 115-room Courtyard by Marriott in Alpharetta, Georgia. ABR Chesapeake Fund V, a value-add real estate fund sponsored by ABR, invested $7.2 million in the joint venture. Financing for the project will be provided by the Bank of North Georgia, a division of Synovus Bank. Construction of the 115-room Courtyard is planned to begin this fall. The hotel will feature the brand’s standard offerings including an indoor pool, fitness facility, business center and Courtyard’s Bistro food and beverage concept. “Courtyard by Marriott has a proven track record of delivering a consistent, quality guest experience,” said Fred Cerrone, Founder & Chairman of Hotel Equities and COO of Hotel Development Partners. Hotel Equities, an affiliate of HDP and experienced hotel operator, will manage the hotel. “The site is ideally located,” said Tom Burton, ABR’s CIO. “It’s within walking distance to Avalon, an abundance of retail and restaurant amenities and also offers easy access to downtown Alpharetta and GA 400. In addition, HDP and Hotel Equities have extensive experience in the Alpharetta market, which we expect will contribute to the success of the asset.” The acquisition represents the first transaction between ABR and HDP.